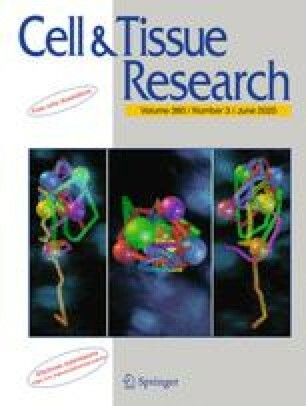 Lymph nodes from sheep foetuses and postnatal lambs were examined to determine the participation of different leucocyte populations in primary follicle formation, with special emphasis on the emergence and subsequent development of follicular dendritic cells during late gestation and early postnatal life. A series of immune and enzyme histochemical markers was used. The first 5′-nucleotidase-positive primary follicles were found at 80 days gestational age (gestation in sheep is 150 days) in superficial cervical lymph nodes. In the last month of gestation the primary follicles possessed follicular dendritic cells, macrophages, dendritic cells, and CD5-positive lymphocytes, in addition to IgM-positive cells. Follicular dendritic cells in primary follicles were found to be ultrastructurally immature. These follicular dendritic cells were characterised by a few, coarse surface projections and many ribosomes attached to the endoplasmic reticulum. A final differentiation to mature follicular dendritic cells was coincident with the postnatal germinal centre reaction. Computer-assisted morphometric analysis demonstrated that the size of 5′-nucleotidase-positive primary follicles in the distal jejunal lymph node, but not in the superficial cervical lymph node, increased significantly during late gestation. It was concluded that stromal cells in primary follicles of foetal sheep lymph nodes were a continuously developing population but that ultrastructural maturity was only achieved in the germinal centres of postnatal lambs.